La Canada safety Angel Salazar has white substance washed from face by trainer shortly after incident in which La Canada accuses a Salesian player of smearing some type of sports cream under Salazar’s face mask. La Canada High School is pondering its next move, if any, after the CIF-Southern Section said it will take no action in regard to an alleged incident that took place during the two schools’ football game on Sept. 4, during which La Canada claims one of its players had some type of sports creme rubbed in his face by a Salesian player following a play. On the play in question, La Canada alleges that a Salesian player reached under the face mask of Spartans safety Angel Salazar and smeared some type of white substance that La Canada claims is a sports cream, similar to Icy Hot. 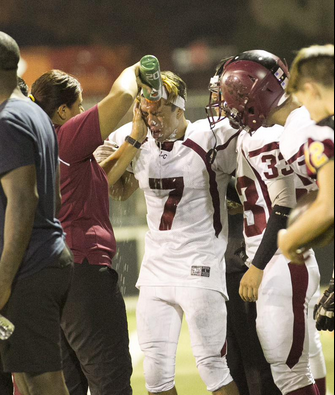 Salazar immediately left the game in discomfort and had his face flushed on La Canada’s sideline by athletic trainers. The situation prompted La Canada head coach Ryan Zerbel to stop the game and tell officials what happened. However, no flags were thrown and no players ejected following about a 10-minute delay. Both schools submitted information to CIF, but without any penalties called or subsequent ejections during the game, CIF had no choice but to refer the matter back to the schools. Salesian won the game, 27-0. Salesian principal Alex Chacon said that following its own investigation, his school did not issue any disciplinary action. “We feel as a school that we would be investigating any unsportsmanlike matter as it relates to any of our students or staff, regardless of whether or not a flag was thrown or a kid was ejected,” Chacon said. “And this is obviously a pretty significant allegation. The only reason I was involved is because I was personally at the game and was able to attest to whatever information was being given on both school’s behalf. Beside what he claims is evidence of a Salesian player reaching under Salazar’s and doing a smearing-type motion, Zerbel said that the same Salesian player also had a white substance clearly visible on his black game pants. The La Canada Valley Sun’s website also reported that the Salesian player was seen washing his hands and removing his gloves after the alleged incident. With CIF and Salesian taking no action, Zerbel said that he will meet with his school’s principal and athletic director to decide what the next step is. He was unaware whether Salazar’s parents were considering any legal action. “It’s a bad situation to be in,” Zerbel said. “I feel as a coach that I have parents who entrust me with their young men. I look at these young men as my own children. We spend so much time together. And I just feel like the system is letting down the kids right now. Until we see a video that La Canada alleges it has of the incident, then it’s hard to have an opinion. Right now it’s a clear case of he said/she said. Oh kind of like what happened at Bishop Amat? Was there clear cut video of why Sweet was suspended or is it pure speculation. I really don’t think you should be commenting on this because clearly it is the other side of the coin with this incident and what happened at Amat. Touche !!!! Great point !!!! If I understand you guys correctly you are saying like Amat there are two sides to the story so Fred and Aram should not comment like at Amat. Well no one offered an explanation or the other side of the coin from Amat or from Salesian so far. As yet there is only one side. Why?? I guess Salesian is taking a page out of Amat’s playbook. Shut the hell up and it will go away in a couple of weeks. Saw the tape of the incident tonight. It was #16 for Salesian. That’s Rahyme Johnson according to maxpreps. You can’t tell if he has anything on his gloves; but, the video is very clear that he puts his hands into the facemask of the LC player in the picture (#7). Based on the reaction of Salazar, which was immediate, he was irritated and shoves at Johnson. You can’t confirm from the tape that Johnson has anything on his gloves but I would say, given the reaction of the LC player, the LC coaching staff, and the LC training staff that the burden of proof that he didn’t have a substance is on the Salesian staff and the player. The picture looks pretty bad too and doesn’t look much like a typical football injury. The referee should have grabbed Johnson and his gloves. Allegedly, the player and coaches ‘played dumb’ when they were asked about the gloves saying they didn’t know where they went. Seems like too crazy of an accusation to say he rubbed a ‘tiger balm’-like substance on a player during the game. Just very odd in the middle of a football game. Too outlandish to be made up. The LC staff definitely believes their own player. Based on the tape I saw tonight, I believe them too. You will believe them when you see it. I do wish the tape was longer. It cuts pretty close to the end of the play. You can only really see it well from the tight shot and it ends abruptly. If true we should change the name from Salesian to Sleazin. Simmons is full of crap, saying that unless there is a penalty or a kid is thrown out of the game there is noting they can do. When there are bench clearing brawls during football games CIF reviews video to determine who they are going to suspend for the following game. Why is this so much different. I seem to remember CIF reviewing video of the DBar/DRanch game and the Wilson/Pomona game a few years ago and suspending a large number of kids from those teams for the following games. You sure CIF suspended those kids or did the schools suspend them? I’m 100% sure that it was CIF that suspended the kids. In fact, a couple of the schools involved tried to argue their point with CIF regarding the suspensions. Here’s an example of what you’re saying. Biggest high school story the past two weeks is of the the two football players who smashed the referee into the ground. They possibly could face assault charges. Now, let’s say the referee’s had no idea it was done intentionally, and nobody was ejected on the field because they thought it was a case of being at the wrong place at the wrong time. However, once the video surfaced a few days later and it was obviously this was done intentionally, are you saying nothing could be done if even the video was reviewed by the sports governing body because the officials during the game didn’t eject anyone? Not a good question or example. The incident you’re referring to in San Antonio led to immediate sanctions and suspensions and action taken by the school districts involved. I guarantee you that whatever the Texas version of CIF is went along with it, just like CIF would have done here, too. And also maybe threaten loss of membership. Stop viewing CIF as some separate entity and/or a policing body. CIF is quite simple the membership or organization of schools. The power is with the schools/school districts of the member schools. THEY ARE CIF! La Canada (or at least their players on social media) ought to name and shame. It’s a lot tougher to pull that sort of garbage when everyone knows what’s coming and there’s a big target on your knee. So the quotes in the game article talked about a substance being rubbed on the ball…and now LC is changing their story…sounds about right for them. In case you have not noticed by now CIF is a castrated impotent entity in place to only collect money and to avoid lawsuits. They take stands on nothing. All the power rests with the schools. And the schools act identical to the CIF. They are there to collect money and avoid lawsuits.Don’t know who is right or wrong in this but the coach is heading in the right direction in suggesting the parents have to take legal action if they want some satisfaction. CIF is so worthless in these types of situations. I just heard Coach Zerbel on Fred Roggin’s radio show. He said he spoke to the Salesian head coach on the field and he could tell from how the coach was responding to him that he wasn’t going to do a thing about it. Typical Sleazin High School. You would think Salesian being a school of religion, would take it upon themselves to discipline the kid who did this, especially if the video shows the kid reaching up under the face mask with a rubbing motion and the La Canada kid reacting in pain. If there really is such a video then it really makes the administration at Salesian look bad. The photo is not conclusive, the video won’t be, nothing about the ball was conclusive. Nothing will occur. If the video is conclusive that he put his hand inside Salazar’s face mask, rubbed his face, and at the very least he’s a dirty player. From there, you can make your own conclusions about the presence of icy hot or something else. Something should occur. The photo & video won’t be conclusive, eh? Care to take a different stance on that obviously flawed opinion? Sweet , Sweet , is there an issue with Sweet , not that I know of ????? Protest , protest , what protest , there’s no protest that I know of ??? No issue now. My take is that the boys won. They took issue with the coaches in what ever manner you choose to call it. Lets say “we don’t practice till we are heard event” and won. Coaches backed down, Sweet reinstated and now the boys and the parents have the coach right where they want him. Micky Mouse should be able to coach that team and win right? If there is no issue now , just how big of an issue was there in the first place beside a player breaking a TEAM rule . This was blown up sky high by the blog and the scribes , from the breaking news post to all the innuendo that followed . It’s over , Sweet is back as our back , now just don’t get caught in that cloud of dust he will leave behind him on Friday night !!!! GO AMAT !!!!! Also isn’t it M-I-C-K-E-Y M-O-U-S-E !!!!! More like RUN , FORREST , RUN as that is what Sweetness will be doing all Friday night !!!! GO AMAT !!!!! This is typical Salesian behavior. Just when I think ” man I’m not sure I made the right decision getting out of coaching”. Stuff like this or the Amat situation happens and I realize I made the right move. A little comeuppance for the rough, tough, street cred Mustangs. The Cubbies rolled ’em up last night, 52-22. I don’t see what these teams get out of getting trounced by PAC-5 schools , How in the heck does this help them with their programs . I know some of the schools are happy in their 2nd or even 3rd tier slots but others, I suspect, believe they could compete at least in the Inland Valley D. La Habra, Villa Park (I know that Lil ‘Cich would like a bigger stage), Redlands EV, maybe a couple of the hosses like Thousand Oaks and Camarillo, guys like that. For them a win against even a mid pack D1 team looms large. The Salesian, Cathedral, Alley Money types would be taken care of (I assume) by the CAA if they demonstrate they belong more than one of current Mission or Trinity schools when re-leaguing goes off again. Just spitballin’ here 73 since I do agree that getting whacked hard by a big boy team must be unpleasant for anyone, especially if you are being told by you 7 on 7 guru that you are just as good as ‘they’ are..
Have a good time with the doggies tonight. The CIF is making a huge, monumental mistake in not nipping this abhorrent behavior. No one who does anything like this should ever play football again. What’s next? A player shoots another player? Indeed America stopped playing football a long time ago.